April 1, 2014: All paintings by Mario Gonzalez Chavajay are 50% off. Sale last until April 15. April 2, 2012: Until Tuesday, April 9 all oil paintings by women artists are on sale. Paintings by Paula Nicho Cumez are 20% off. Paintings by Vicenta Puzul de Gonzalez, Maria Teodora Mendez, & Maria Elena Curruchich are 50% off. New paintings by Julian Coche Mendoza have also been posted. December 21, 2012: New Maya calendar cycle. Arte Maya is now publishing posters. The first posters are by Pedro Rafael Gonzalez Chavajay and Paula Nicho Cumes. September 22, 2011: Paintings by Lorenzo Gonzalez Chavajay have been added to the paintings for sale. August 4, 2010: Exhibition of paintings in Berkeley, CA at Mo'Joe Cafe. Reception: Tuesday, August 17th. June 2, 2010: The 2011 Arte Maya Calendar is arriving from the printer this week and is now available for purchase. Six postcards featuring Maya artists are available for sale. This is the first time we have offered postcards for sale and we are pleased at the quality. June 9, 2010: Twenty-four new paintings by Diego Isaias Hernandez Mendez have been added to his gallery. May 26, 2010: The new paintings of Emilio Gonzalez Morales have been posted to his gallery. May 24, 2010: Four new paintings for sale have been added to Pedro Rafael Gonzalez Chavajay's gallery. Two new links have been added to the links page. July 20, 2009: Twenty paintings by Diego Isaias Hernandez Mendez have been added to his gallery for sale. July 16, 2009: Thirty-one new paintings added to the gallery of Mario Gonzalez Chavajay. A new market page has been added for paintings from the Arte Maya calendars. March 31, 2009: New paintings by Julian Coche Mendoza, Paula Nicho Cumes, and Pedro Rafael Gonzalez Chavajay added. August 25, 2008: Paintings added to Felipe Batzin gallery. July 20, 2008: The works of four women artists, Paula Nicho Cumes, Vicenta Puzul de Gonzalez, Maria Teodora Mendez de Gonzalez and Maria Elena Curruchiche, have been added to the Archives section. Compared to the number of male Maya artists, there are very few women artists, and fewer still good artists. These four women are worth checking out. July 9, 2008: A page explaining the basics of how the Maya Calendar works has been added in the Histories section. July 3, 2008: The long over-due overhaul of the Juan Sisay archives has gotten done. More than twenty new images have been added, making this page probably the most informative collection anywhere for images of paintings done by Juan Sisay and his apprentices. This page could not have been done without the help of many people who bought paintings by Juan Sisay. June 19, 2008: Emilio Gonzalez Morales has had paintings in the Arte Maya calendar for four years now. I am pleased to be able to offer several of his paintings for sale now. New paintings have been added to the gallery for Vicenta Puzul de Gonzalez, the first Tz'utuhil Maya woman painter. June 17. 2008: New paintings by Mario Gonzalez Chavajay have been added to his paintings gallery. June 15. 2008: Paintings by Maria Teodora Mendez de Gonzalez, the second Tz'utuhil Maya woman to take up painting, can now be purchased in the paintings section of the website. June 14. 2008: Twenty new paintings have been added to the gallery of Isaias Hernandez Mendez. I have found several of his paintings that still need to be photographed, so they should also be posted in a few weeks. June 13, 2008: After photographing paintings for three weeks, the recent additions have begun to be posted on the website. The first gallery update is of Domingo Garcia Criado. For the first time the paintings of Maria Elena Curruchiche, a Kaqchikel Maya woman artist from San Juan Comalapa, are being offered for sale. There will be many more paintings by other artists posted in the next few weeks. October 17, 2007: Tiny watercolors by Elva Vasquez and her husband have been posted for sale. Ten new paintings have been added to the gallery of Juan Fermin Gonzalez Morales. July 21, 2007: Our 2008 Arte Maya calendar is ready. March 29, 2007: A new gallery of paintings done by San Pedro artist Guillermo Nicolas Chaz Perez has been added. He was tragically killed in a bus accident in 2000 at the age of 27. These are the last paintings he did before his death. A close friend of mine in San Pedro had guarded them since Guillermo Nicolas' death, but my friend died last year. March 24, 2007: Seventeen of the twenty paintings that Pedro Rafael Gonzalez Chavajay created in the last two years are now up on the web. They are the first of the new paintings I brought back from my January trip to Guatemala. June 14, 2006: Paintings have been added to the galleries of Pedro Rafael Gonzalez Chavajay, his brother Mario Gonzalez Chavajay, Miguel Angel Sunu Cortez, and Domingo Garcia Criado. Two other pages in the Paintings section have been opened. The Under $150 page incorporates several pages ($50, $75, $100 & $150) which were just too difficult for me to keep up with. The other page is new, and consists of Major Paintings—those paintings which are large (30" x 40" minimum) and of exceptional quality. Why so many new paintings? I got a new digital camera which allows me to take one picture which is high enough quality for all purposes. This means I don't have to piece together two photographs of one half of each painting to get the quality and size I need, saving me about an hour of work for each painting. The second reason is that I have gone through the paintings I currently possess by each artists and have decided to sell quite a number of paintings I had been previously saving. Without realizing it, I had been putting aside an unreasonable number of paintings. I will be posting more paintings by other artists in the near future as I get them organized and photographed. June 4, 2006: The 2007 Arte Maya Calendar is out. More than fifteen paintings have been added to the gallery of Jose Antonio Gonzalez Escobar. May 30, 2006: Thirty paintings have been added to the gallery of Diego Isaias Hernandez. The format of the Paintings section has been changed which should make it easier to view and select paintings. November 13, 2005: I have added new sites to the Links page. On this page I have comments on some of my personal favorites. Near the bottom of the page there links to good links pages. The topics relate to some aspect of this website—Guatemala, Indigenous peoples, Maya, Latin art, etc. November 11, 2005: The rest of the 9" x 11" paintings from the new shipment have been posted. Except for one exquisitely beautiful painting by Miguel Angel Sunu Cortez, the paintings are by a new artist, Aatuun Ch'ab'aq jaay, the youngest brother of Pedro Rafael Gonzalez Chavajay. November 3, 2005: A new shipment of paintings has arrived, and the first postings—small paintings by Isaias Hernandez Mendez and Luciano Sitan Sicay—have been posted. July 22, 2005: The 2006 Arte Maya Calendar is now available. For the first time it contains the Maya glyphs for every day of the year. March 19, 2005: We obtained a small quantity of the children's book Diego Isaias Hernandez Mendez illustrated, Trouble Dolls a Guatemalan Legend. It is out of print. January 24, 2005: Miguel Angel Sunu has been added to our list of quality painters who have paintings for sale. Domingo Garcia Criado has new paintings for sale. The archives section has been divided into two parts, one where the paintings are grouped by artist, and a new one which groups the paintings by theme. The pages are labor intensive, so we will be adding to them slowly. We will also be redoing the artists section and we have started with the page on Lorenzo Gonzalez Chavajay. January 16, 2005: The Maya culture discussion group has begun and we invited you to participate with your questions or comments. We also have posted a page of paintings for sale by a recent discovery Luciano Sitan Sicay from Cerro de Oro. February 2, 2004: We are inaugurating the first Tz'utuhil Mayan woman painter Vicenta Puzul de Gonzalez with a solo exhibition at Cup-O-Java in San Francisco. Vicenta is the wife of renowned painter Mariano Gonzalez Chavajay. After many years of working with her husband helping him with his paintings, Vicenta has decided paint only under her own name and wants to work exclusively with Arte Maya Tz'utuhil. A page of Vicenta's past works appears in the archives section. January 18, 2004: New paintings (for sale) were added to Mario Gonzalez Chavajay's page and to that of his uncle Jose Antonio Gonzalez Escobar. January 15, 2004: Our shopping cart system has been upgraded so that Paypal is available as a purchase option. January 10, 2004: Several artist's work have been added to the ARCHIVES section: Vicenta Puzul de Gonzalez, the first Tz'utuhil woman painter; Jose Antonio Gonzalez Escobar, her uncle; Miguel Angel Sunu an emerging young painter, and the brothers Juan Fermin Gonzalez Morales and Emilio Gonzalez Morales. December 10, 2003: An exhibition of Diego Isaias Hernadez Mendez paintings entitled "Pesadillas" [Bad Dreams] has been put up and at the same time is on the web. In spite of its subject matter it is a light hearted exhibition reflecting Isaias's ability to laugh at life's disasters. It will be on exhibition until February 1, 2004 and on the web indefinitely. November 6, 2003: Pedro Rafael Gonzalez Chavajay's pages have been updated and eight new paintings have been added. November 4, 2003: Eight new paintings by artist Domingo Garcia Criado have been added to his gallery page. Ten more will be added in the near future as photographs are taken of them. October 4, 2003: All paintings by Mario Gonzalez Chavajay have been put On Sale for between 30 and 50 percent off. New paintings have been added and will be added in the following days. Added Oct 16: There is also an exhibition of Mario's paintings in San Francisco California until December of 2003. For the first time you can see and buy the paintings on the website at the same time as at the exhibition. September 30, 2003: More paintings have been added to Jose Antonio Gonzalez Escobar's page of works for sale. These are a little larger (11" x 13") than the one's currently on the page (9" x 11"). There will be some additional paintings added in the next few days. September 26, 2003: Our 2004 Arte Maya Calendar is ready. September 10, 2002: Thirteen paintings by Jose Antonio Gonzalez Escobar have been added to his page in the Paintings section. We are happy to get these paintings as we had sold out all of his previous work. This time we have some larger paintings by him. We should be posting more in the next few days. September 9, 2002: In the Paintings section new paintings have been added to Pedro Rafael Gonzalez Chavajay's gallery pages. The gallery has been divided into two pages, one for small paintings [Pedro Rafael] and the other for medium and large paintings [Pedro Rafael 2]. To promote lagging sales in this recession, quite a number of these paintings have been put on sale. Art is a much better investment than the stock market. April 17, 2002 A trip to Lake Atitlán in February produced 2000 photos from which to choose some good ones. The Photographs section will be featuring many of these photographs. The first page in the Photographs section to benefit is The Artists of San Pedro la Laguna. November 24, 2001: Jose Antonio Gonzalez Escobar has been added to the our stable of artists. He has been painting for many years and is well established in Guatemala. There are also new paintings by Mario Gonzalez Chavajay and Isaias Hernandez. All the navigation buttons have been re-done to be more consistent and to make it easier for you to tell where you are and find your way around. Many page have been updated and old images have been replaced by newer clearer ones. October 27, 2001: A shopping cart system has been added to the site so people can buy now paintings online through a secure connection, without the limitations of Paypal. The paintings pages have been updated and expanded with many new paintings. August 28, 2001: Links page expanded. Our links section is very good, not because we spend much time on it, but because it contains links to lists of links on other web-sites where the people have gathered links about various related subjects. It is an excellent resource for people writing articles or reports. August 24, 2001: The first Arte Maya Tz'utuhil calendar (for 2002) has come out and is for sale, both on this website and in stores. February 2, 2001: The Textile or traje section has been greatly enlarged. 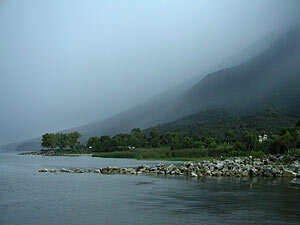 There are individual pages for many of the pueblos (such as San Antonio Palopo) around Lake Atitlan. There is also a Bibliography page. March 21, 2000: A few books/booklets are finally offered for sale on the Books page under the Paintings section. January, 2000: Two important exhibitions: (San Francisco CA) Tz'utuhil Mayan Painters will be the most important show of contemporary Mayan paintings ever assembled outside of Guatemala; and (Santa Cruz, CA) an exhibition of paintings by the first tz'utuhil mayan painter and his grandson. June 12, 1999: We have begun a large project to replace the majority of our early images with better digital images.In some cases the colors of the paintings will appear less intense, but in nearly all cases they will be more detailed, richer in color and truer to the original painting. The small paintings we scan directly from the painting; the large paintings are photographed with a digital camera. In order to get the more detail we ofter piece together two or more scans/photos to make one image of the painting. 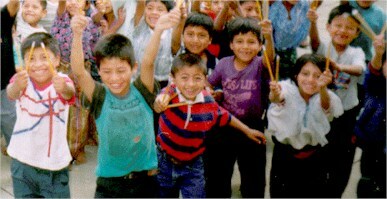 March 21, 1999: More detailed information and a separate page for Casa Rosario, the Spanish Language School in San Pedro la Laguna, Solola Guatemala. An Interview which was published in Cultural Exploring Magazine about Arte Maya Tz'utuhil has also be put on line because it clarifies a bit about our history and who we are. March 9, 1999: For people who are traveling to Guatemala and want to learn backstrap weaving, there is a page of information on one of the weavers, Gudelia Cumes, offering classes in San Pedro la Laguna. February 10, 1999: The Operation of a Death Squad in San Pedro la Laguna by Benjamin Paul and William Demarest tells the story of the violence in San Pedro from 1980 to 1985. Just a few brave artists painted subjects such as the death squads and these paintings along with others are shown on the web for the first time to illustrate this article. The article is quite long for the web but it is broken up into six more manageable bites. The humanity of the writing is accented by the charm of the paintings. December 20, 1998: Section on Chema Cox, a Tz'utuhil-Mayan watercolor artist, added to the Catalogue of Paintings section. September 11, 1988: Guatemalan Textiles, the main page of a new section which is authored by Margot Blum Shevill, is finally up and running. We will be adding more examples of the textiles of different pueblos of Lake Atitlán to this section as time goes on. August 11, 1998: Current Exhibitions updated with an upcoming exhibition in San Francisco. The artist Victor Vasquez Temó will be coming to San Francisco for this exhibition.
. August 10, 1998: David Hamilton took photographs of Semana Santa in Santiago Atitlan when he was there in 1997 and 1998. August 2, 1998: Juan Sisay, Santiago Atitlan's first and most famous painter, is represented with a painting (soon to be paintings and a page of his paintings) on the web. March 21, 1998: A new section called Projects. The first project covered is Pedro Rafael's pencil project pictured above. November 28, 1997: San Pedro la Laguna in 1941, a page of photographs by Benjamin and Lois Paul.